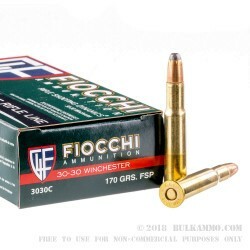 This 30-30 Win cartridge by Fiocchi sports a 170 grain flat soft point bullet. Ideal for match shooting and all around target practice, this bullet’s flat tip is good at shearing neat circles through paper targets which are easily visible downrange. (Perhaps a wadcutter does a better job of this, but those bulky bullets don’t play nicely with semi-automatics and lever actions most of the time. 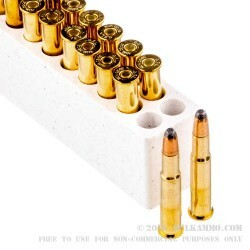 You will find that this type of bullet works particularly well in a tubular magazine, which it was designed for.) 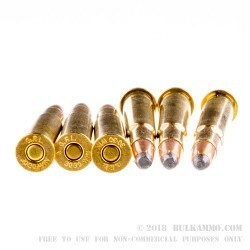 You may wonder whether the flat nose spoils the bullet’s aerodynamics, but that simply isn’t the case in the grand scheme of things -- this cartridge’s 2,200 fps muzzle velocity in no small part helps to compensate for any conceivable loss on that front. 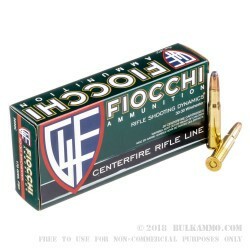 Fiocchi has a solid reputation for the quality of their ammunition’s components, which they make themselves from raw materials so as to control for that reputed quality completely. There are few rounds you would better chamber in a 30-30 Win rifle.